This superb photo shows the loco at work back in the halcyon days of 1988, where British-built locos were common place. 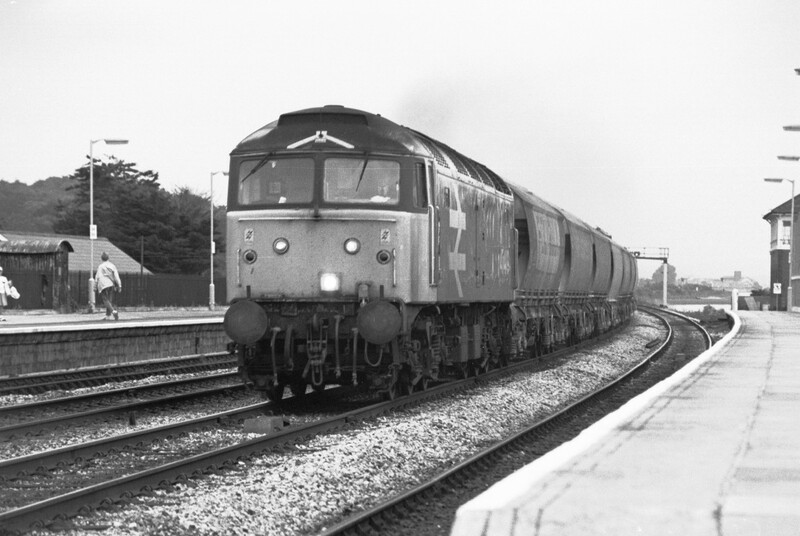 47449 is seen hustling a southbound freight that looks very much like a speedlink grain train through Dawlish Warren. Note the loco is sporting a very shiny looking NRN aerial on the cab roof, which has presumably not long been fitted. The date is 16th of July 1988 – good times! Thanks to Adrian for allowing us to reproduce the image and for David Dawson for tracking it down. Below are a selection of other shots courtesy of our former Webmaster and Group stalwart, Martin Corbett. Please click on the thumbnails to view a larger image. Please be patient as the images will take a short time to load up as they are currently archived externally. Although preview thumbnails are not available, clicking the red crosses will take you to each image. All photos taken by Martin Corbett, unless credited otherwise.